Janlynn's Floss Bobbins with 2.75" Ring are a great companion tool to any of our cross stitch projects. Includes 28 high-quality plastic bobbins with sturdy metal organizer ring to make needlecrafting on-the-go a breeze. 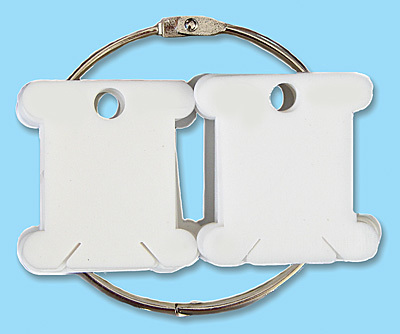 Metal ring features an easy-release clasp for adding or removing bobbins. Each bobbin measures 1.75".